In 1985, Hiram student Tim Walker completed a paper entitled, “A History of the Stephens Observatory and Telescope.” The paper, written for class credit, stands today as the history of Hiram’s observatory and telescope. Fittingly, Mr. Walker received an “A” for his work. You can read the paper here; you will need Adobe Reader or other appropriate software in order to open the PDF. 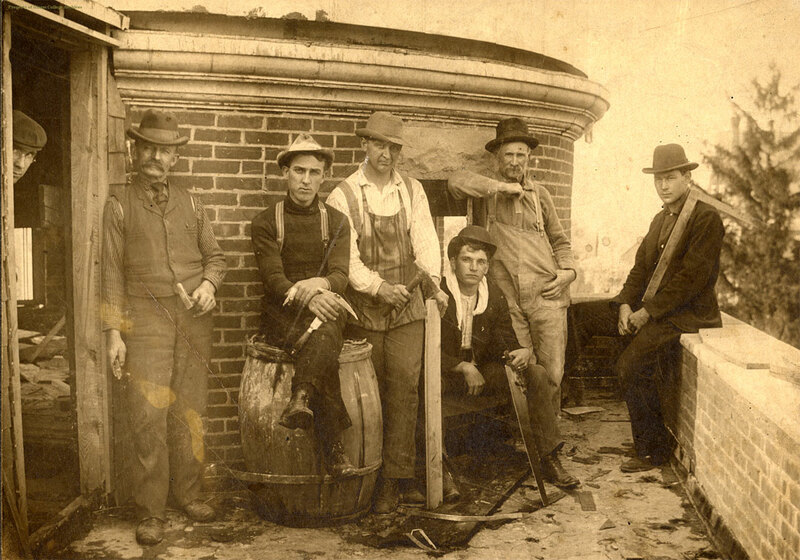 Workers pose for a photograph at the base of the rooftop observatory on the Teachout Library building about 1900. The lower edge of the rotating observatory dome can be seen at the top of this picture (click to see an enlarged image). Photo courtesy Hiram College archives. This is a view looking south, across Hinsdale Street, at the northern elevation of the building. The photographic print was discovered at a February 2009 North Canton auction by Cary Bacher of Richfield, Ohio who provided us with a scan of the image. 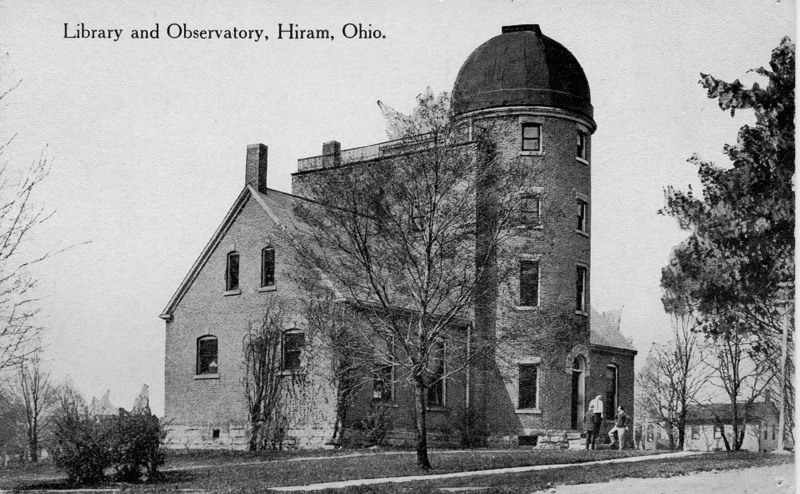 A new library building was completed in 1900 at Hiram College and included observatory facilities. Donor Abram Teachout paid the full cost of construction: $10,000. A dome sat atop a tower above the treetops. The low, flat-roofed structure at the left side of the library is a transit observatory. The facility was beautiful but its location, atop the building’s boiler room, was not good. Soot and heated air dirtied the telescope’s lens and roiled the air. This view is from the southwest looking northeast. This view of the original Teachout Library and Observatory is from the northeast looking southwest. 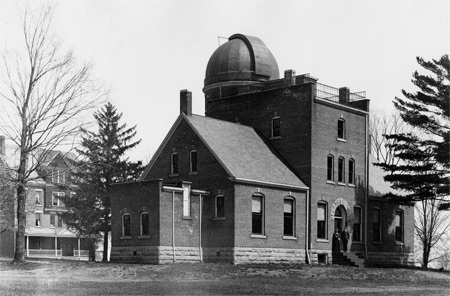 A portion of the original foundation was incorporated into a newer building on campus, including the distinctive curved base of the observatory tower. This site is the highest elevation on campus and in Hiram. Upon the occasion of his 80th birthday, Disciples of Christ (Christian Church) minister Lathrop Cooley purchased a high-quality telescope for the new library building. Built by Warner and Swasey, Cleveland, the telescope cost $4,000. 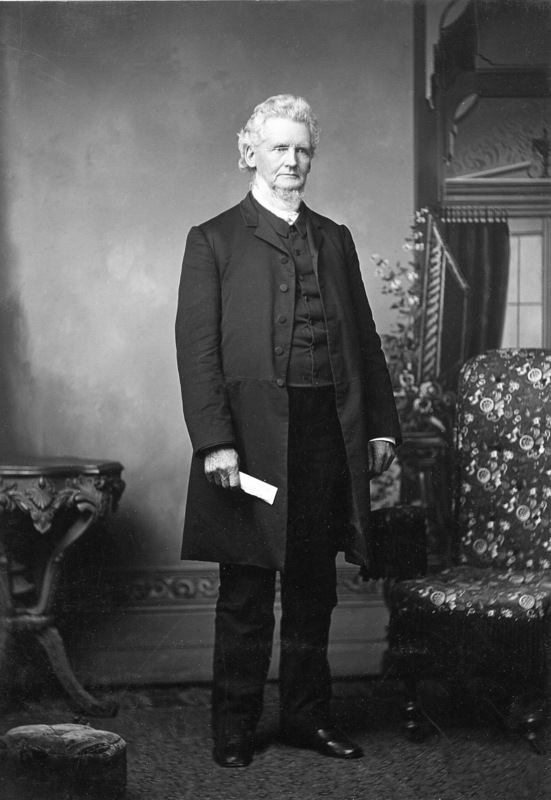 During dedication ceremonies, Cooley remarked, “This instrument is erected here so that you may climb the steep of heaven and walk among the stars.” Cooley, an active minister in Disciples of Christ churches, was also a successful businessman, philanthropist, real estate investor, and a benefactor and trustee of Hiram College. He was buried in Woodland Cemetery in Cleveland. Original image by Watkins of Medina, Ohio; undated. 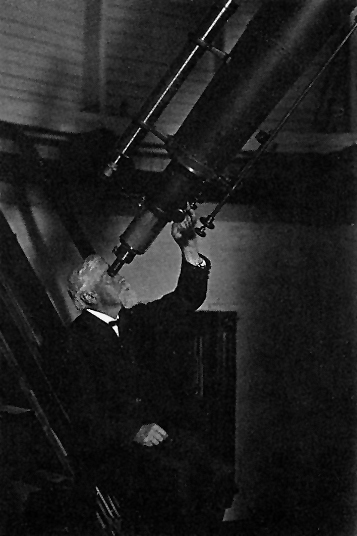 Colman Bancroft, professor of mathematics, at the eyepiece of the Cooley Telescope, at the Teachout Library and Observatory about 1901. 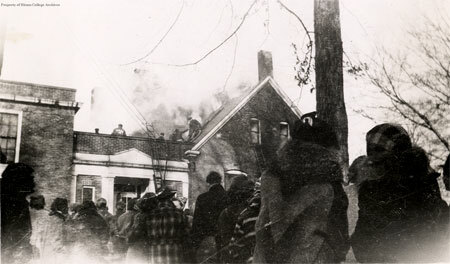 Spectators watch in the cold February 1939 air as firefighters work on the roof of the burning Teachout Observatory and Library. The library was seriously damaged in the incident. Fortunately most of the library’s collection and the observatory were saved. The outlines of the lower portion of the observatory tower can still be seen on the north side of , now, the Teachout-Price Building. Image courtesy Hiram College archives. In February 1939 a fire seriously damaged the Teachout Library. Fortunately for astronomy, the Cooley Telescope was isolated enough from the main building that it escaped serious damage. 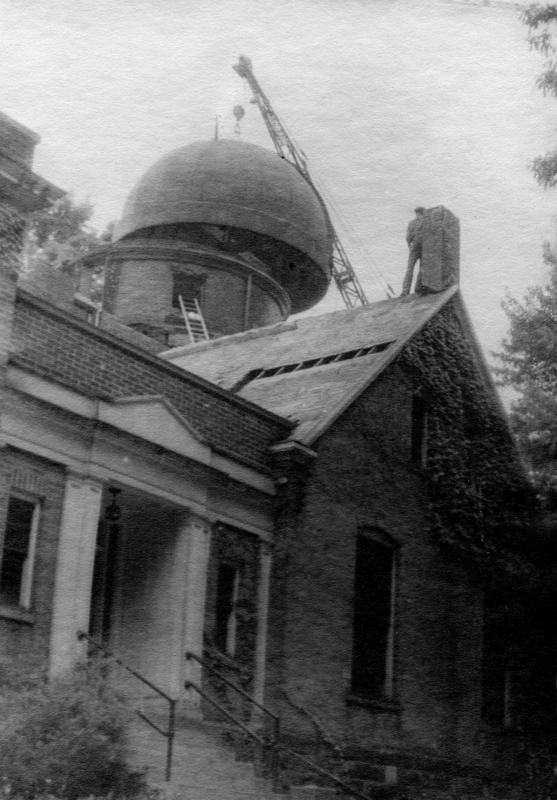 The wood-framed, metal-skinned dome was removed and kept for reuse; the telescope shipped off to Warner and Swasey, Cleveland, for cleaning and checking. 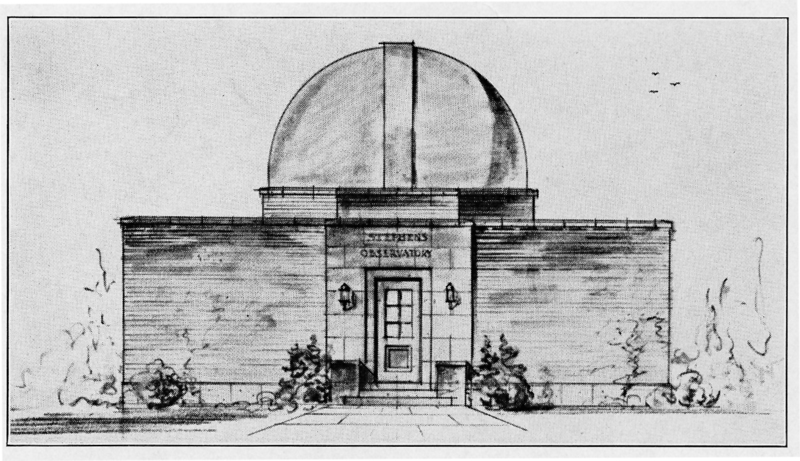 On April 9,1939 came the announcement that Ella M. Stephens would donate funds for the construction of a new observatory facility to house the Cooley Telescope and support astronomy at Hiram College. The observatory was to be named in memory of Miss Stephens’ family. The architect’s initial rendering differs in several details from the building as it was finally realized. Prof. Elbert Howard Clarke using the telescope in the newly-built Stephens Memorial Observatory. 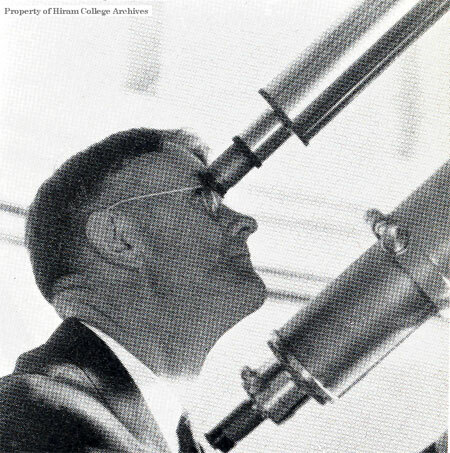 Prof. Clarke, a mathmatics instructor (from 1917 – 1957), is seen looking through the finder telescope attached to the much larger Cooley Telescope in the observatory. Note how the brass finder has been polished to a lusterous finish. Brass fittings on the Cooley are also clean and bright, probably the result of their trip back to the Warner and Swasey telescope works in Cleveland following the library fire. This photo was taken from the 1941 edition of the Spider Web Hiram College yearbook. Chagrin Valley Astronomical Society on a field trip. ~ 1966. 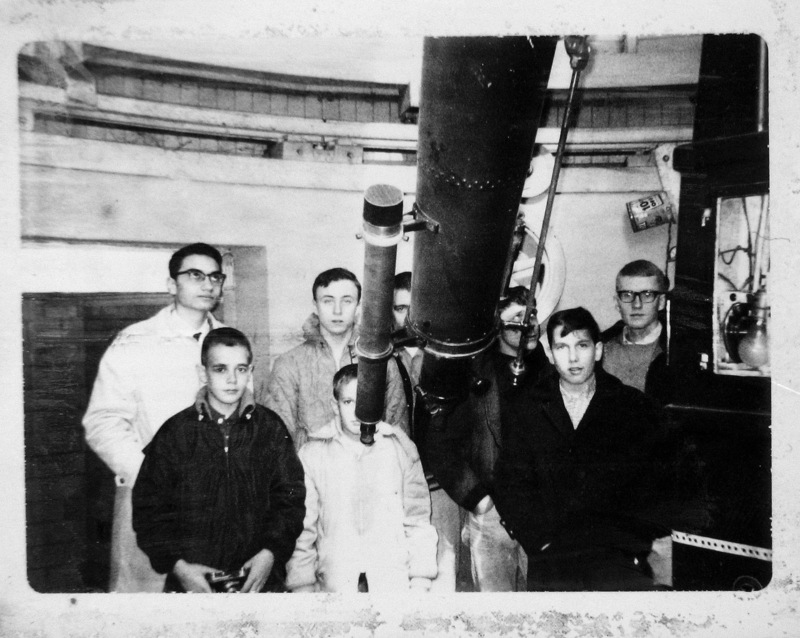 The group pictured is the Chagrin Valley Astronomical Society on a field trip. The shot was very likely taken in 1965 or 1966. The club was started in 1963 by Tony Mallama (upper left) and another youth. At this point in its history the telescope’s pier was apparently painted black and the telescope’s optical tube was another dark shade. note the coffee can in the upper right background, apparently serving as a homemade light. A bare lightbulb in the clock chamber within the telescope pier was used to keep the mechanism warm and dry. This is a scan from a small Polaroid photographic print. 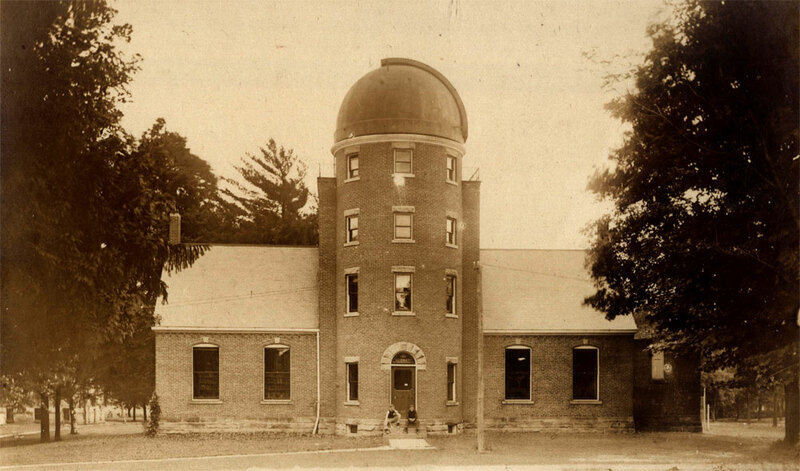 What a wonderful surprise to see my brief history of the Stephens Memorial Observatory still being used and referenced — thank you for making it available online! Nowadays I teach history at the University of Massachusetts, but I have great memories of stargazing and studying astronomy at Hiram in the mid-1980s. With very best wishes, Tim Walker (Hiram, 1986).